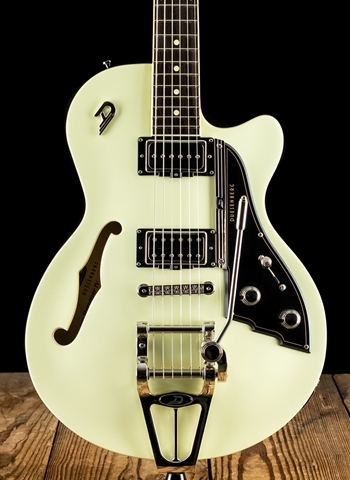 Our semi-hollow deluxe guitar is played by many of the top players in the world. The Starplayer-TV features a greatly improved 60s style tremolo and a floating bridge with steel saddles. Our custom-wound DP90 in the neck position gives an authentic blues tone making a versatile combination with the vintage Humbucker in the bridge position. The distinctive arched spruce top and elegant flamed maple arched back has elevated the DTV to one of the finest guitars in the world. It will remind you of the time when rock n roll was young. Radius: 30,5 mm / 12"
Scale Length: 650 mm / 25.6"
Size: 46 x 34 x 7 cm / 18.11" x 13.38" x 2.75"